There are multiple efforts at present to strengthen and revive the peace movement in the United States, and this is a critical necessity. 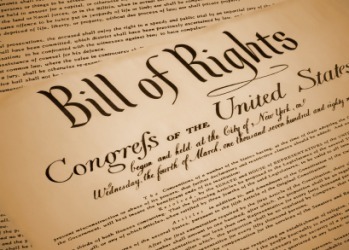 As we wrote several weeks ago, a crisis either manufactured or not can be used to impose greater restrictions on our civil liberties and push through unpopular policies. It is up to us to prevent a crisis by seeing through commercial media spin, analyzing current events and responding to them through both organized resistance and promoting a positive alternative. 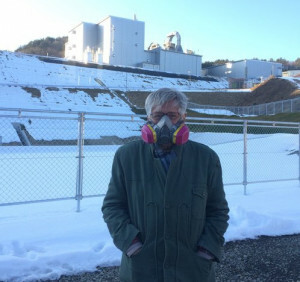 Arnie Gundersen wearing his respirator in front of the nuclear waste incinerator. On this anniversary, we face another perilous situation that is brewing. Scientists moved the doomsday clock to 2 and a half minutes from midnight. This is the closest it has been since 1953. It is due to the related threats of the climate crisis and war, which reinforce each other. The United States is escalating its military presence and threats in multiple areas. This week, the Trump administration showed support for sending thousands of troops to Kuwait to fight in Iraq and Syria. This is on top of hundreds of additional US troops that were deployed to Syria to join the 500 already there. The Intercept has a new report that counters the Pentagon’s claims that a recent SEAL raid in Yemen was a success. Six women and ten children under thirteen were murdered in the raid. And Micah Zenko reports that drone strikes have increased 432% in the past months under Trump. Mission creep under Obama has turned to mission leap. Will the US come to its senses on Korea? If people only listen to the commercial media, they might believe that North Korea is a huge threat to the United States, but actually it is the opposite that is true. Several years ago, we wrote this article to place North Korea’s actions in the context of the US’ long history of aggression and antagonism. You may be surprised to know that the US first attacked Korea in the 1870′s and, in addition to killing millions of Koreans during the Korean War, the US has actively undermined South Korea’s attempts to become a democracy. This week South Korea impeached President Park Geun-hye, the daughter of a dictator and an ally of the US, for extensive corruption. 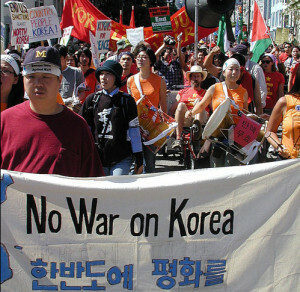 This took the efforts of millions of South Koreans organizing both mass protests and new political parties. Now a new election must be held within two months. The favored candidate for president supports a ‘sunshine policy’ of friendlier relations with North Korea. Multiple times each year the US and South Korea conduct war games that include amphibious landing and nuclear attack on North Korea. Reuters 2016. This places the US in a dilemma. 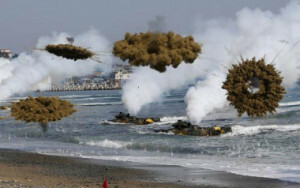 For years, the US and South Korea have regularly waged extreme military exercises close to North Korea, even simulating a nuclear attack on North Korea. North Korea urged Trump not threaten them with nuclear attack and warned it would respond with testing missiles if the war games occurred, and they did. Those exercises are happening right now, having been moved up from June when they were initially scheduled to take place. 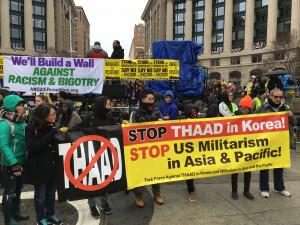 The US is working to complete construction of its THAAD anti-missile system, which is viewed by China as antagonistic and is opposed by the party likely to win the South Korean election. With a new government that wants better relations with North Korea coming into power in South Korea in 60 days, will the US find a reason to attack North Korea to create chaos? Let’s hope not. China is brokering a common sense solution, that is if one believes that it makes sense to avert nuclear war. The US and North Korea are not talking, but China suggests that the US stop its regular military exercises against North Korea, and in return, North Korea will stop work on its missile systems. We need to see beyond any attempts by the commercial media to frighten the public into supporting an attack on North Korea. If we can avert it, we have an opportunity for peace. We’ll discuss this in more depth on Clearing the FOG on March 20. Click here for information about how to listen..
President Trump campaigned on a platform of non-intervention, but all signs point to a continuation of the US’ meddling foreign policy. The new chair of the anti-democratic National Endowment for Democracy (NED) is Dr. Judy Shelton, who has a long history of involvement in US regime change efforts. Shelton was on the NED board during the US-backed coup in Ukraine against a democratically elected president. Bruce Gagnon writes about US involvement in the coup in Ukraine, which was a response in large part to Ukraine’s move to strengthen its relationship with Russia instead of the US and EU. Almost three years later, progressive activists, particularly the Council of Mothers, continue to resist the new regime. An alert went out this week from Odessa seeking help to stop the persecution of these protesters. Western Ukraine is an area that was very supportive of Hitler and it is now a center for fascism associated with the Kiev government, which is in conflict with the eastern part of the country. Crimea’s history with Russia is complicated. It had been part of Russia from 1774 until 1954 when Nikita Khrushchev, an ethnic Ukrainian, transferred Crimea to the Ukrainian Soviet Socialist Republic. It later became the Crimean Autonomous Region, which had it’s own foreign policy in the 1990′s. Ukraine granted Crimeans legal grounds for using the Russian language. 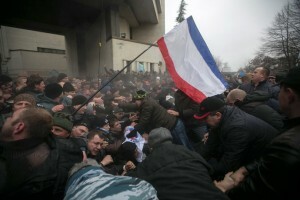 When the US-supported coup government came to power on February 21, 2014, it immediately started threatening Russian-speakers in eastern Ukraine and stopped allowing Russian to be used by its government, which led to protests in Crimea on February 23-26. Russia has a long-term military base in Crimea with a lease agreement extending up to 2047. On February 27, troops from the navy base came to the aid of Crimeans, who then formed a new government, wrote a declaration of independence and held a referendum on March 16 to annex Crimea to Russia. In response, the US put in place sanctions against both Russia and Crimea. Bi-partisans in Washington, DC are pushing for conflict with Russia, which they escalated during most of Obama’s terms and right up to the final days of his administration. They oppose Russia’s defense actions in Ukraine and Georgia and support for Assad in Syria. Under the Obama administration, the US placed troops, missiles and bases along the Russia-NATO border. If Trump moves toward détente, as he pledged during his campaign, opposition in Congress, the intelligence agencies and Pentagon will escalate and he will require support from the public. Ajamu Baraka urges people not to get caught up in anti-Russia hysteria, as he works to rebuild the Black peace movement. We must let the public know that a war with North Korea or conflict with Russia are the results of US foreign policy and blow-back from the long-term creation of conflicts. 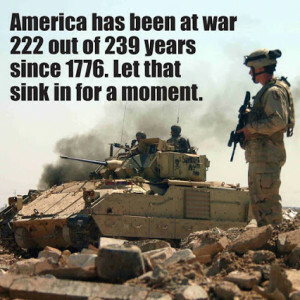 The United States has been at war for most of its existence and has a deep war culture. 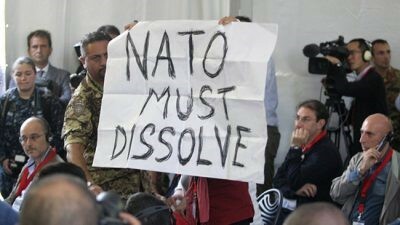 The peace movement must make US foreign policy the issue and not allow people to be fooled by the propaganda that surrounds war. We hear from many corners of the movement that people are interested in organizing to stop war. You can start in your community by looking up local groups that work on this issue and getting involved or by finding some like-minded people and getting together to discuss current events and how to organize locally. 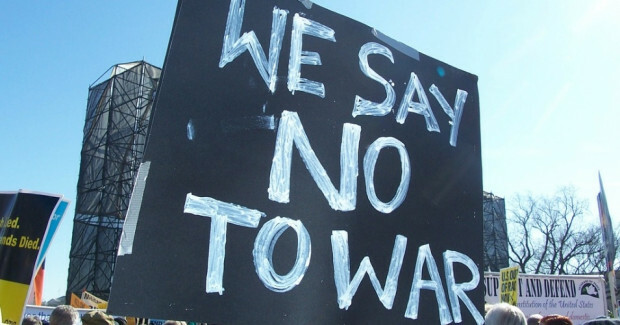 March 18 – Stop Endless Wars. Join the Minnesota Peace Action Coalition at Mayday Plaza, 3rd and Cedar, West Bank, Minneapolis, for a rally and March. 1:00 pm. World Beyond War maintains a calendar of peace events. Click here to view it. In the year 2017 that certain men and women exhibit any preference at all for wars and violence seems completely anachronistic, representing a worldview which has already effectively gone extinct, and should have by now gone the way of the dinosaur.